Sally Ann Passarella leaves behind a lasting legacy at South High that will never be forgotten. It’s 6:30 p.m. at Great Neck South High School. Extra help is long over, sports practice has finished, the musical rehearsal is winding down and the custodians are the only people left in the halls. However, a light still shines from one particular office, illuminating one particular dedicated teacher hard at work: Mrs. Passarella. Sally Ann Passarella, age 62, passed away peacefully on Sunday, Oct. 21, after a six-year battle with colon cancer. She leaves behind a lasting legacy at South that will never be forgotten. She earned a bachelor’s degree in English and a master’s degree in English Education at Queens College. She first taught English at Andrew Jackson High School in Queens and, later, at Ss. Joachim and Anne School in Queens. After years of substitute teaching while her children were growing up, Passarella found a permanent position teaching English at Great Neck South High School. For nearly 20 years, she shared her love of Shakespeare, English poets and classical horror in the classroom through projects and lectures. While working full time, she earned her administrative degree from Hofstra University in 2008, becoming dean of students for Great Neck South in 2010. Passarella was devoted to every aspect of the school community, from teaching her students about writing strategies to helping students get through hard times to conducting the morning announcements. She went above and beyond her responsibilities as English teacher and dean, creating a balance between helping students in the classroom and her office, and improving the school as a whole. She was very instrumental in developing school spirit throughout South. Assistant Principal Sharon Applebaum noted that Passarella would “spend hours listening to music” and choosing the most festive and encouraging songs for Friday between periods. During her free periods, Passarella would visit each department of the school to check in with teachers who had been experiencing both positive and negative life events, guiding them through anything they needed. She would even take time out of her family life to go to dinners with colleagues or to see shows, attend events and read research in which teachers were involved. In addition to her roles at school, Passarella was particularly fascinated by student safety both in and out of the classroom, organizing activities such as the Driving Safety Fair. Many can remember that warm and inviting feeling that Passarella’s lively greetings (and candy) filled them with every time they passed her office. Passarella’s door was always wide open for both students and teachers. She had a reassuring quality that could make anybody feel comfortable and at ease. Moreover, her positive outlook on life with the ability to “make the best of any situation” was one most people don’t possess. “I think all students knew that she would give their matter her full attention, no matter how big or small, whether it was a personal issue, a behavior problem, a concern over another student or advice,” Dean of Students Peter Gottfried said. 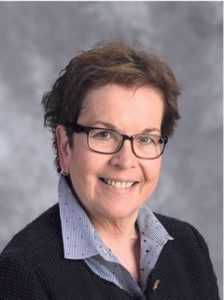 Because she was never too busy for anybody, she could always “make parents, kids and teachers feel better,” reflected Applebaum, who remembers her ability to create a special bond with the students. After having to discipline a student, Passarella would lure them back to her office the following days with candy. Through these daily positive interactions, she would converse with these students, paying attention to them and making them feel important. Passarella’s wholehearted dedication to the school as a dean and English teacher was unwavering and inspiring. Her focus was always on the students, and she always put their needs above her own. She arrived at school well before the teachers and students started to trickle in and was often in her office working past dark. “If there was a fundraiser, she sponsored a bunch of them and never took the credit for it,” Gottfried explained. Passarella’s selflessness shone through as she neither sought credit nor needed recognition for her actions. “Her greatest acts were completely unheralded and unknown, those moments in the hall, for example, when she would draw a student aside and quietly, compassionately listen and guide,” reflected Dr. David Manuel, head of the English Department. In collaboration with Gatto, she would bring her classes outside to complete outdoor team-building challenges, many of which related to English studies. Passarella always wanted to bring out the best in her English students, being “tough but never without that human element,” according to Elliott. Instead of reprimanding students for performing poorly on an assignment, she would respectfully discuss the work with her students and present them with new and innovative ways of approaching similar material. For students going through tough times, she would never scold them with disciplinary issues for breaking school policy. Instead, she would encourage them to learn from their mistakes and help them develop into empathetic people. According to Manuel, she was devoted to “reaching out to students and identifying those who might benefit from direction or redirection,” drawing students aside to listen to their stories and rewarding them for changes in their demeanor. Our school was lucky to have had Passarella as a part of our community, and we can all agree that she has left Great Neck South High a much better place than before she started. She will be greatly missed, but the kindness, patience, warmth, commitment, love and impact she had on the faculty and students will be felt throughout the school for generations to come. I never knew who she was during my years at Great Neck South. Oh that’s right, I was segregated in special education classes. I wouldn’t want to be in an integrated English class with her. I have terrible memories of inclusion when I went to Village School.